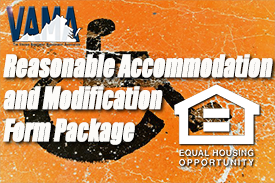 As part of membership within VAMA, VAMA is pleased to make this New and Improved Reasonable Accommodation / Modification Form package available FREE to members of the association. With the rise online websites claiming to provide verifications and blurring lines between those meeting the legal definition of disabled and those not, it is vital for property managers to follow the steps necessary to insure those meeting the legal definition of disabled receive the accommodations/modifications they are entitled to as part of the Federal Fair Housing Act. VAMA has assembled these forms to assist property management professionals in managing this process. Detailed flow chart outlining the reasonable accommodation/modification request process. Reasonable Accommodation/Modification Request Verification Form. Analysis Worksheet to use when reviewing verification form. Questions and Analysis Worksheet for telephone call with verifier. Approval or Denial of Accommodation/Modification Form. VA Fair Housing Office Guidance Document on Reasonable Accommodation Requests for Assistive Animals. Script for owners to address assistance animal concerns with residents. VAMA strongly encourages the usage of forms such as these any time a reasonable accommodation/modification request is relayed to management and the existence of a disability is not obvious and/or the nexus between the disability and requested accommodation/modification not apparent. Please note these forms are being provided free of charge to members of the association and are for the exclusive use of VAMA Members. VAMA makes no representation of any kind, express or implied, regarding the legal validity of such forms, and if you have any questions regarding the use of these forms, you should consult your own legal counsel. By signing your name during purchase you signify your understanding and agreement, that you and your company will hold VAMA harmless for any issue that may arise by the use of these forms, and that your use is solely at your own risk.